Weetabix already have a wide variety of breakfast cereals, including their Original (and best) Weetabix, Banana Weetabix, Golden Syrup Weetabix, High Protein Weetabix, Organic Weetabix and the popular Weetabix Minis. But it seems those behind the scenes at Weetabix have decided we need more choice. So, if you haven’t seen them yet, Weetabix have introduced two new varieties of Weetabix under the 'Additions' range. These are: Coconut & Raisin and Apple & Raisin. Can you have too much choice? I really think you can. Just take a look at the cereal shelves in large supermarkets. They’re groaning with umpteen varieties of the popular breakfast cereals. Even plain porridge oats come in all manner of guises. Although my eyes start glazing over when I enter the breakfast cereal aisle, I do still keep a look out for new entries. 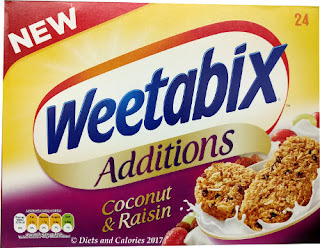 I haven’t purchased these new Weetabix as I don’t like raisins, so this post is just for information and nutritional purposes. 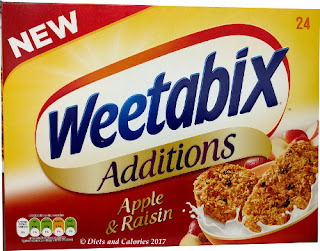 Both new varieties of Weetabix have added raisins, one has desiccated coconut and the other has dried apple pieces. Both contain 15g of sugar per 100g which is amber on the traffic light scheme. Each Weetabix has around 3.25g of sugar which equates to just under 1 teaspoon per Weetabix. They’re both fortified with added B vitamins as Vitamin D and are suitable for vegetarians. General consensus seems to be that they are a little too sweet and people would prefer to buy the plain Weetabix and put their own toppings on. Here are the ingredients and nutritional values.